The offices of Ron J. Anfuso, CPA/ABV – An Accountancy Corporation, specialize in services that specifically address the issues involved in complex marital dissolution (divorce) cases, business valuations and civil/commercial litigation cases. Ron J. Anfuso, CPA/ABV, An Accountancy Corporation, is a specialized Los Angeles Forensic Accounting firm, which provides litigation support services including analysis of financial, accounting and tax aspects of marital dissolution matters, expert witness testimony and business valuation. If you are not satisfied with the Forensic Accountant you have been using and prefer to find a CPA you can count on, let me show you why Ron J. Anfuso, CPA/ABV – An Accountancy Corporation is the better choice. 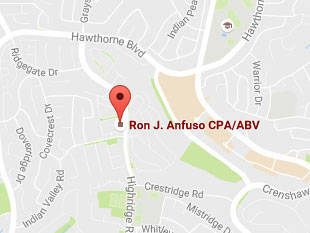 My name is Ron J. Anfuso and I am the President of Ron J. Anfuso, CPA/ABV – An Accountancy Corporation. Ron J. Anfuso, CPA/ABV – An Accountancy Corporation meets these standards. I invite you to review the content of my website and discover why my firm is a better choice. Offer available to any new client – will be happy to answer your accounting questions directly for no fee. Do You Need a Forensic Accountant?